Those are the two words I've managed to come up with to describe my day at the Central Alberta Quilt Show in Red Deer yesterday. There were more merchants than I remembered there being last year and the year before, which is a Good Thing, and all seemed to be doing steady business -- even the long-arm salespeople, and those are Big Ticket Items! An Incomplete Sentence - Orlanda Brown - 33" x 55"
Ms. Brown designed this piece using selvedges (spelled 'selvage' in some places, apparently), deliberately intending it to look as if it were part of a larger project. There are no borders on 2 sides! 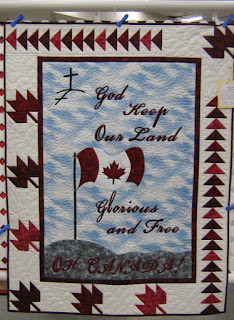 Oh Canada!- Corinne Hewitt - 39" x 50"
Corinne, a pattern designer, also had a booth at the show. The sentiments she expresses in her pieces really speak to my heart. Here's the second one of hers I decided to photograph. 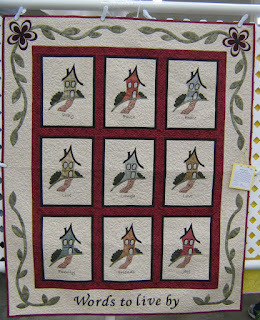 She designed the blocks originally as single hangings with embroidered phrases, and gave them to family members for Christmas. 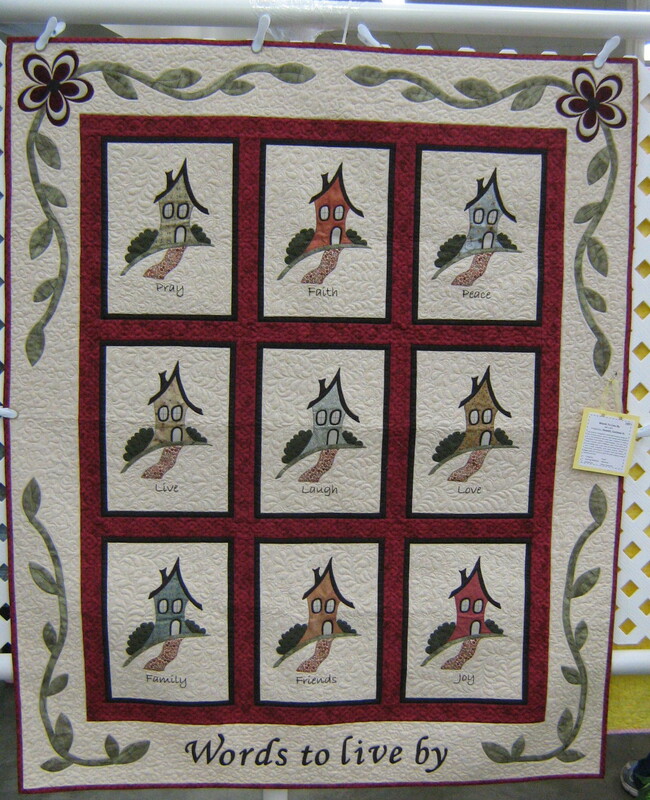 However, she liked the way they looked altogether, too, so she ended up making a quilt. 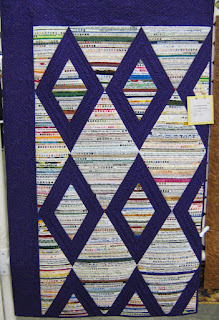 Words to Live By - 44" x 53"
Current Affair - Sherry Renschler - 90" x 110"
Star Chain - Wendy Rowledge - 84" x 108"
Quilted Diamonds - Cathy Tessier - 88" x 107"
One other quilt I just had to take a shot of what this completed Orca Bay Mystery Quilt -- from Bonnie K. Hunter's quilt-along in which Yours Truly participated between November 2011 and January this year. It was just so great to see one completely finished! 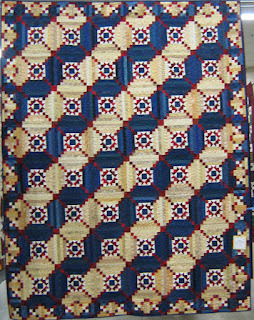 Orca Bay - Debbie Woods - 74" x 84"
Alas, it was hanging where I couldn't back up to photograph it fully -- without knocking over the quilt behind me -- so the top and bottom have been cut off. 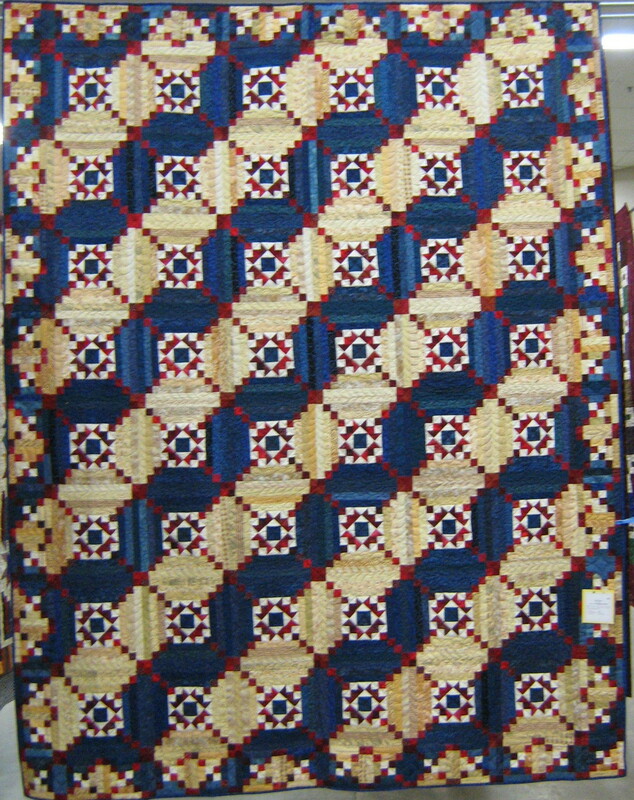 Those of you who've at least pieced your top will have an idea how they look though, as she followed the border pattern closely. Finally, in the main exhibit hall, there was this lovely tribute to a Guild member who passed away in November 2011. 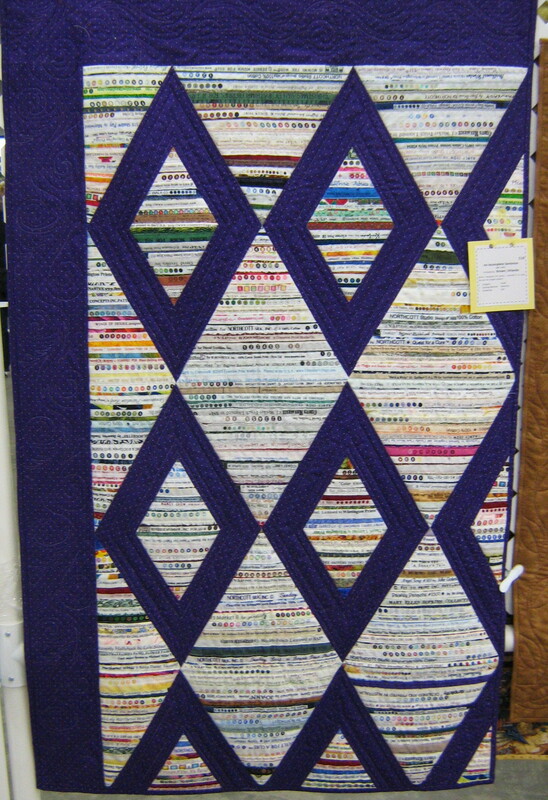 Her name was June, and she was known not only for her quilting but for her quiet sense of humour and her generous gift of time and teaching to new members. Here's a photo of a photo (!) -- a retrospective of her life and work. And here's a shot of how the display looked in general (both photos taken with permission of Patti Morris, Co-Rep for Alberta). In addition to the cards and CDs for sale, we had a binder with the Artist's Statements and copies of SAQA exhibit catalogue and the SAQA Journal for folks to peruse on site, and a stack of brochures for those interested in more information and/or membership. 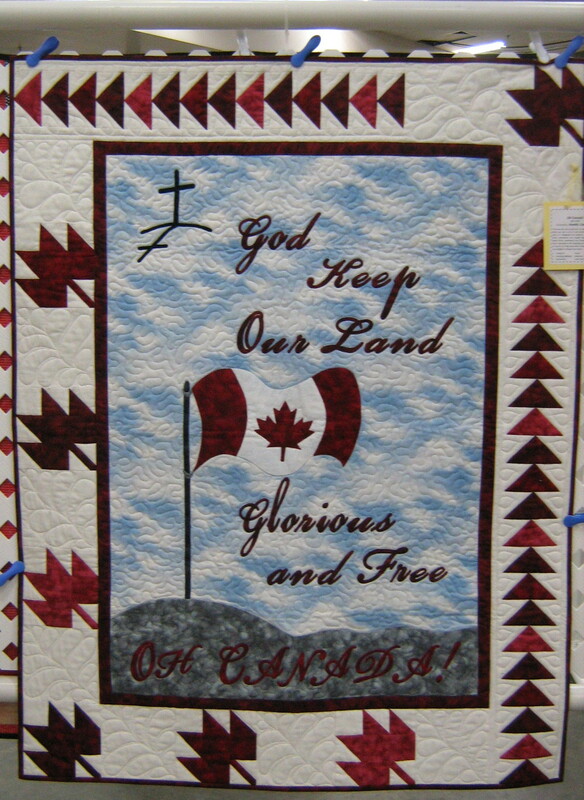 We also had a few surveys for Art Quilters from the Alberta Quilt Project, as well as notes detailing Lucie Heins' up-coming talk about the project, June 20 in Camrose. All were very well received. I worked at the exhibit between 3 and 7 p.m.; except for a lull between 4 and 5, when those who'd been at the show since the morning were going home and those coming after work had yet to arrive, I had a steady stream of viewers to see it. Most were appreciative. Many were looking for names they recognized. Others wanted to draw inspiration from the work, perhaps seeking that 'something' to move them out of their own comfort zones. And some whizzed through it with vacant looks, either not understanding what it was about, or not wanting to know! It's always an education to participate in and work at an exhibit like this, as well as an opportunity to educate others about the art, and textile as a medium. My day (perhaps my year!) was made by the last visitor of the evening, who so enjoyed the exhibit that she was moved close to tears. To my delight, she purchased a card featuring my piece, looked me in the eye and said, "I'm not buying this because you're standing there in front of me; I'm buying this because [your piece] reminds me of my home." What more can an artist want? Congratulations on the sale! Even more congratulations that it went to someone who so enjoyed your work-what a lovely compliment she gave you! What a great end to a day. Love the photos! Thank you for allowing me and others to view the exhibit through your eyes. Fascinating how diamonds kept cropping up. Congratulations on selling Your piece. Loved all the diamonds! Thanks for sharing your day with us!